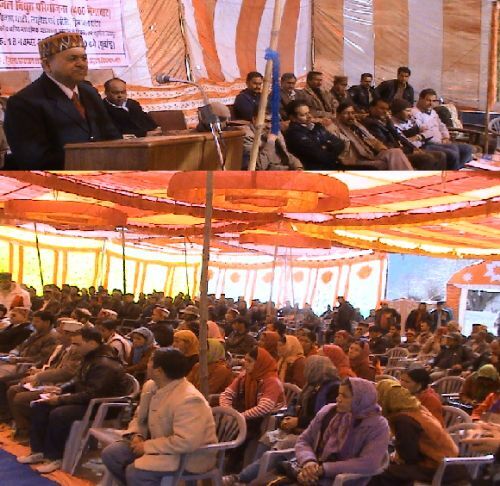 The public hearing of the proposed 400 MW of Seli Hydro Electric Project was organised by the district administration, Lahaul & Spiti and Pollution Control Board, Himachal Pradesh at Madgran. The SDM, Udaipur Sub Division Sachin Kanwal presided over the function. In this programme, 400 people of four panchayats namely Tindi, Udaipur, Triloknath and Shakoli participated and discussed about the effects coming out of this project. DGM, Seli Hydro Electric Project, Rajesh Gupta disclosed that “14 families of the Ratauli village will be relocated and they will be suitably compensated and rehabilitated as per the norms and rules of the HP government.” He said that one man of each affected family will be given job according to their qualification, eligibility, and proficiency. Mr. Gupta also revealed the detailed bio-diversity of the management plan of the company which will be executed with the help and the support of IHBT. He also shared that company would emphasize on overall socio-economic development of the region including marketing of handicraft items and establishment of vocational training institutes and food processing plants. DGM also told that Seli Hydro Electric Project will generate 1400 million units of electricity and will be constructed at an estimated cost of Rs. 2200 crores. Environmentalist- Tog Chand Thakur, Former Vice Chairman Zila Parishad- Dhyan Singh Thakur, Member Tribes’ Advisory Council – Shamsher Singh, Uppradhan of Udiapur panchayat – Rajendra Singh Thakur, Panchayat representative – Dharampal participated in the discussion and expressed their fears and doubts arising out of this hydro electric project. They said that company should emphasize on balanced development of the area by not disturbing ecological aspect and the people who are to be relocated should be suitably compensated in all possible ways. The company has ensured that it will try its best to minimise the relocation and deforestation and due care will be taken of all the aspects so that the ecological balance of the environment is maintained and the peoples’ lives are not adversely affected. On this occasion, senior personnel of the company- S. K. Khare, A. K Jha, Virender Sharma, Satish Sharma, XEN-IPH, DFO-Forest, SDO-HPSEB, SDO-IPH and other panchayat representatives of the four panchayats were also present and actively participated in the discussion.